Learning to swim should be a priority for every family. It's an important life skill that can play a key role in helping to prevent drowning―a top cause of death among children. Children, and their parents, need to learn how to swim to help keep time in the water safe and fun! Here are some tips from the American Academy of Pediatrics (AAP) on the best time to start swim lessons and what to look for in a quality learn-to-swim program. Children develop at different rates, and not all are ready to begin swim lessons at exactly the same age. When making your decision, keep your child's emotional maturity, physical and developmental abilities and limitations, and comfort level in the water in mind. The AAP recommends swim lessons as a layer of protection against drowning that can begin for many children starting at age 1. Recent studies suggest that water survival skills training and swim lessons can help reduce drowning risk for children between ages 1-4. Classes that include both parents and their children also are a good way to introduce good water safety habits and start building swim readiness skills. If your child seems ready, it's a good idea to start lessons now. By their 4th birthday, most children are ready for swim lessons. At this age, they usually can learn basic water survival skills such as floating, treading water and getting to an exit point. By age 5 or 6, most children in swim lessons can master the front crawl. 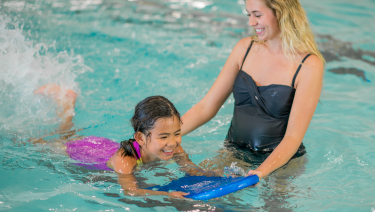 If your child hasn't already started in a learn-to-swim program, now is the time! Does AAP recommend infant swim classes? No, because there is currently no evidence that infant swim programs for babies under 1 year old lower their drowning risk. Infants this age may show reflex "swimming" movements but can't yet raise their heads out of the water well enough to breathe. It's OK to enroll in a parent-child water play class to help your infant get used to being in the pool, though; this can be a fun activity to enjoy together. Remember, swim lessons don't make kids "drown proof." Always keep in mind that swim lessons are just one of several important layers of protection needed to help prevent drowning. Another layer includes constant, focused supervision when your child is in or near a pool or any body of water. It also is essential to block access to pools during non-swim time. The Consumer Product Safety Commission found that 69% of children under the age of 5 years were not expected to be in the water at the time of a drowning. Look for classes and instructors that follow guidelines focused not just on swim stroke techniques, but broader water survival competency skills. All children should learn how to get back to the surface from under water, propel themselves at least 25 yards, and get out of the water, for example. Instructors should evaluate children's progress and give ongoing feedback on their skill levels. Have experienced, qualified instructors. Swim instructors should be trained and certified through a nationally recognized learn-to-swim curriculum. There should also be lifeguards on duty who have current CPR and First Aid certification. Teach good safety habits in, on, and near water. Children should learn to never swim alone or without adult supervision. Instructors should teach children to always ask for permission from parents, lifeguards, or swimming instructors before they get into a pool or natural bodies of water like a lake. Teach what to do if they end up in the water unexpectedly. This includes practicing water competency skills such as self-rescue. Lessons should provide training with a variety of realistic conditions, such as falling in and swimming in clothes. Older children also should learn what to do if they see someone else in the water who is struggling, and how to get help. Let you watch a class first to see first-hand if it is right for your child. Not all swim lessons are created equal, and parents should investigate options to choose the best fit. Are they swimming most of the time, or are there long periods of inactivity where they are waiting for their turn? Do children get one-on-one attention? Are the instructors friendly and knowledgeable? Require multiple sessions. Once children start lessons, you should be able to see gradual but consistent progress in their abilities over time. Continue lessons at least until your they master basic water competency skills. Provide an age-appropriate atmosphere. Your child should feel safe and secure during lessons, with activities that support their social, intellectual, physical, and emotional development. However, children need to develop a healthy respect for water, as well. Include "touch supervision." Whenever infants and toddlers are in or around water—even during swim lessons―an adult should be within arm's reach to provide "touch supervision." Parent participation should be encouraged, especially since it also helps families know what to practice in between classes. If you can't be in the water with your child, look for private classes that offer 1-on-1 instruction. Maintain water purity. Young children are more likely to swallow or breathe in water, so water disinfection and maintaining proper chlorine levels is really important. A good program should also require the child to wear a swimsuit that is snug-fitting at the legs to help avoid spreading body waste into the water. Keep the water warm. Hypothermia is a greater risk at this age. Ideally, swim and water safety classes for children age 3 and younger should be in water heated to 87 to 94 degrees Fahrenheit. If you're worried your family can't afford swim lessons, check with your city government. Many towns have scholarship programs that help cover the cost of swim lessons held at public pools. Reach out to qualified instructors about possible payment plans or scholarship options. Proper supervision in the water—even if your child is learning how to swim―is one of the most important ways to help prevent drowning. Drowning is quick, silent, and much more common than most families realize. It happens every day to children with loving, attentive parents and caregivers. Pay close, constant attention. Do not get distracted with other activities (such as reading, playing games, using the cellphone, or mowing the lawn), even if lifeguards are present. Avoid using alcohol or drugs around the water, especially when supervising others. For younger children and weak swimmers, get in the water with them. "Touch supervision" is essential! Even if you are not swimming but there is a pool or body of water nearby, always keep children within arm's reach. If you must leave, take the child with you. Don't leave a baby or young child in or near any body of water under the care of another child. Especially during parties or picnics at the pool or lake, when it's easy to get distracted, assign a "water watcher" whose job is to constantly keep eyes on the child in or near the water. Take turns, passing along a water watcher card to the next responsible adult after a set time (such as 15 minutes). Remember that the primary drowning risk for toddlers age 1-4 is unanticipated, unsupervised access to water. Children are naturally curious and commonly slip away unnoticed during non-swim times. Always use life jackets when in, on or near natural bodies of water, such as lakes or rivers. Make sure they fit properly and are approved by the U.S. Coast Guard. Children. Weak swimmers should also wear life jackets when at a pool or water park. Know how to recognize signs of distress and respond when there is trouble. Everyone, including parents, caregivers and older children, should learn CPR and safe rescue techniques to respond to a drowning incident. Water safety is a family affair! Enrolling in quality swim lessons―once your child is ready for them―is one of several essential ways to help prevent drowning. Talk with your pediatrician if you have any questions about whether your child is developmentally ready for swim lessons and how to find a quality program for your family.